From 1st to 5th October 2018, following their participation in the conferences organised in Dire Dawa (2012) and Warsaw (2015), twelve members of the WIDE team participated in the 20th International Conference of Ethiopian Studies that took place in Mekelle. This was made possible by funding from the Swedish Agency for International Development. The conference, the 20th to be held since 1959, brought together over 500 scholars from all over Ethiopia and other countries with a tradition of research in Ethiopia. The week offered a wonderful opportunity for scholarly debates across a wide range of disciplines and topics. With other longstanding WIDE Ethiopian colleagues and newer members of the team, Pip Bevan, Catherine Dom, Alula Pankhurst and Sarah Vaughan organised a panel entitled ‘Globalisation and Rural Ethiopia’ speaking to the theme of the conference ‘Regional and Global Ethiopia – Interconnections and Identities’. A total of fourteen papers were presented at the well-attended panel (over 50 participants), of which twelve were based on new empirical data collected by the WIDE team earlier in 2018. 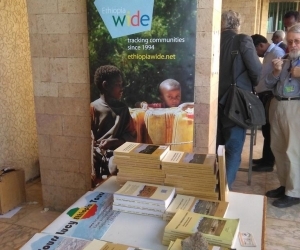 The conference also offered the opportunity for the team to distribute free copies of the ‘WIDE book’, published in Addis Ababa in January 2017 and based on earlier-made empirical data (Change and transformation in 20 rural communities in Ethiopia: Selected aspects and implications for policy, edited by Alula Pankhurst). The presentations given by the WIDE team at ICES20 are available to download here.